One of the best perks of The Platinum Card® from American Express and The Business Platinum® Card from American Express is access to Centurion Lounges. These lounges are at airports, and are for the most part significantly better than what’s offered by US airlines, as the lounges have complimentary cocktails, hot food, and a couple of them even have spas. While this isn’t at an airport, Amex has announced another cool lounge concept — Amex will be operating a Centurion Suite at the 2018 US Open, which will have similar access requirements. It’s located within the new Louis Armstrong Stadium, and will be a great place to relax and recharge. The Centurion Suite will be open from 12PM until 8PM on August 27 through September 5, 2018, and from 12PM until 5PM on September 6 through 9, 2018. Platinum card members will be able to bring two guests, while Centurion card members will be able to bring two guests or immediate family. Complimentary premium snacks, small bites and water, in addition to one complimentary drink (beer, wine or cocktail – must be 21+). Additional selection of finely crafted cocktails, beer and wine will be available for purchase. Obviously this doesn’t sound like it has quite as many amenities as usual Centurion Lounges, though the reality is that it’s nice to get any place that has air conditioning at the US Open, let alone to get a free alcoholic drink, soft drinks, and even some food. We see a lot of brands trying to interact with US Open fans, though this is definitely one of the more valuable opportunities. 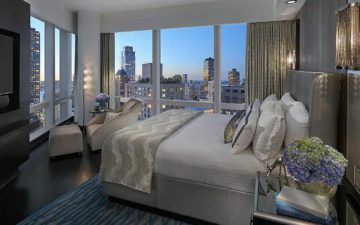 If you’re going to the US Open this year, do you plan on checking out the Centurion Suite? Predictions: What Ultimate Rewards Transfer Partners Could Chase Add? This is exciting! I’ve been going to the US Open every year since 2003 and this year is its 50th anniversary! I’m most excited to see the new Louis Armstrong stadium though I’m a bit unsure whether it was a good idea for them to not have air conditioning installed especially when the roof is used. Either way, at least the Amex Centurion suite will have A/C!